Large venues can be problematic, my solution is to work with what is already there and not try to reinvent the wheel. 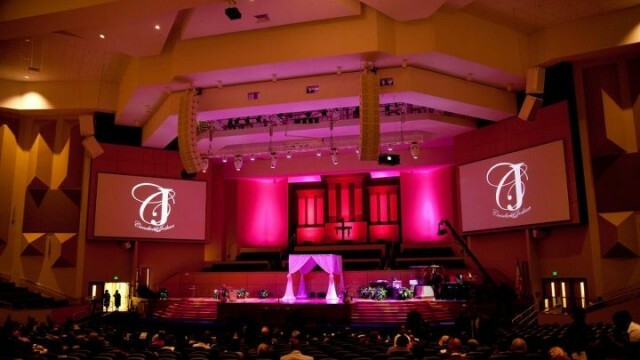 This 4,000 seat sanctuary at New Psalmist Baptist Church in Baltimore would have proved impossible to ornately decorate due to cost and its sheer size. Instead we focused everything on the feature of the event, the space that the couple would exchange their vows. A simply draped canopy and accent lighting, that’s it and the effect was breathtaking.